Lost & Found: "What would you say to Akronites fifty years in the future?" That first experience in 1994 set Karm on a new career that hits another milestone this month as his Hoppin’ Frog Brewery celebrates its tenth anniversary. Soon after that first brewing experience, the same friend took him to a homebrewers’ meeting at which he won barley and hops as a door prize. After a couple of years homebrewing, he landed his first job as a professional brewer in 1996 with Thirsty Dog Brewing Company—a major change from his day job as an electrical engineer. Karm worked for Thirsty Dog for nearly ten years until it shut down operations. Karm bought its brewing system and launched Hoppin’ Frog in 2006 in a small facility across from the Akron Airdock. Karm named the new venture after himself. Growing up his family had nicknamed him Frog “since my dad is also Fred.” While at Thirsty Dog, he developed a reputation for skillful work with hops, winning three awards with a hoppy beer. His longtime nickname and signature brewing skill came together in Hoppin’ Frog. Early on, he established a niche as a brewer of bold-flavored, high-alcohol beers and caught the attention of beer connoisseurs and writers. Throughout its history, Hoppin’ Frog has collected awards at beer competitions and secured high ratings at “beer geek” websites like BeerAdvocate.com and RateBeer.com. In 2013, the last year that RateBeer ranked its entire Top 100, Hoppin’ Frog was rated the seventeenth best brewery in the world. It continues to make the site’s annual list of the world’s 100 best breweries. The brewery maintains a line of seven to nine beers that are in regular production. Through its history, it has registered over 60 different beers, producing 25-30 different brews in a given year. In its first year of operation, Hoppin’ Frog produced around 800 barrels of beer. Last year, it produced 1600 and, after having added additional tanks to the brewing system, Karm aims to produce 2200 this year. In 2013, Hoppin’ Frog introduced a tasting room, also to critical acclaim. In addition to 24 taps running at three different temperature settings, patrons can pair beers with dishes that emphasize fresh, seasonal, and locally produced ingredients. Thanks in large part to the tasting room, the employee roster has grown from Fred Karm to over 35 employees. Becoming a brewery owner also led Karm to lobbying. During his first year in operation, the Ohio legislature considered a law that would have required all brewers to sell beer through distributors even if they sold it in their own facilities. Such a law would have little effect on large breweries but would have hurt the craft brewers. For example, sales at the brewery made up ten percent of Hoppin’ Frog’s revenues in the early years because the brewery received the retail price without a cut going to a distributor. 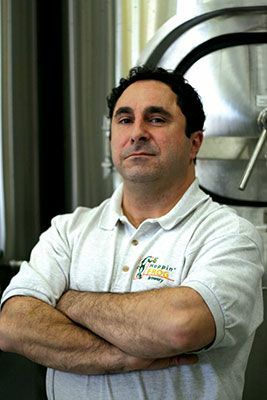 Fred Karm helped lead an effort to bring the craft brewing community together to oppose the proposed law. Ultimately they “were able to rally the troops and get it shot down.” Over the years, craft brewers were able to form the Ohio Craft Brewers Association. “We learned to have a voice,” says Karm. Today the association lobbies for laws that help small breweries, brew pubs and tasting rooms. For example, the legislature recently lifted the 12 percent cap on percentage of alcohol a beer can contain. Thanks to that change, Hoppin’ Frog will introduce the latest in its most famous line of beers—the oatmeal Russian imperial stouts. From the beginning, the brewery won plaudits for its B.O.R.I.S. the Crusher Oatmeal Imperial Stout. A few years later saw the release of the barrel-aged. D.O.R.I.S. the Destroyer Double Oatmeal Imperial Stout. When the new law goes into effect on Wednesday, August 31, Hoppin’ Frog will release T.O.R.I.S. the Tyrant Triple Oatmeal Imperial Stout which clocks in at 13.8 percent alcohol. 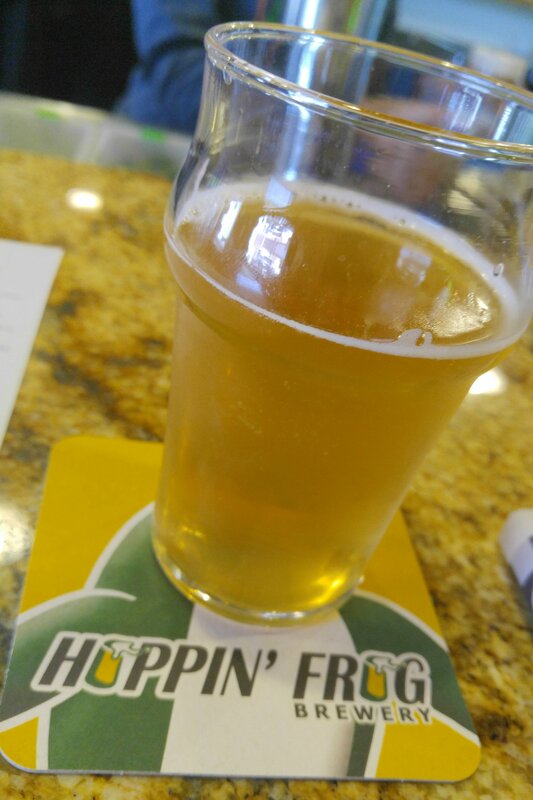 Find Hoppin’ Frog on the web at hoppinfrog.com or check out the tasting room at 1680 E Waterloo Rd.